We have Toscanini's Beethoven, Furtwängler's Beethoven, Karajan's Beethoven, Kleiber's Beethoven, and, if you must, Norrington's Beethoven. But where is Beethoven's Beethoven? My nomination for Beethoven pure and simple would be the LP of the Seventh Symphony seen above, recorded by Hans Schmidt-Isserstedt. This great German conductor, who was born in 1900, was a product of the kapellmeister system. After studying at Berlin University he held a series of posts at German opera houses before being chief conductor of the Deutsche Oper, Berlin from 1943 to 1944. Despite holding such a prominent position under the Third Reich, Schmidt-Isserstedt was not a member of the Nazi party. This perceived political "neutrality" counted in Schmidt-Isserstedt's favour with the occupying forces at the end of the war and he was invited to form the Symphony Orchestra of North German Radio (NDRSO) in 1945, a position he held until two years before his death in 1973. Hans Schmidt-Isserstedt made many great recordings with the NDRSO of the mainstream repertoire, and at the same time championed contemporary music by Stravinsky, Bartók and Hindemith. He also composed, and his opera Hassan gewinnt was premiered in Wuppertal in 1928, while his son Erik Smith went on to become a respected Decca recording producer. Away from the NDRSO in Hamburg Hans Schmidt-Isserstedt recorded Mozart and Schubert with the London Symphony Orchestra for Mercury, and Berwald for Tono in Denmark. But, arguably, his finest recordings were the cycle of Beethoven Symphonies he made with the Vienna Philharmonic Orchestra. I bought the vinyl LP of Beethoven's Seventh Symphony seen in the photo above in 1974. 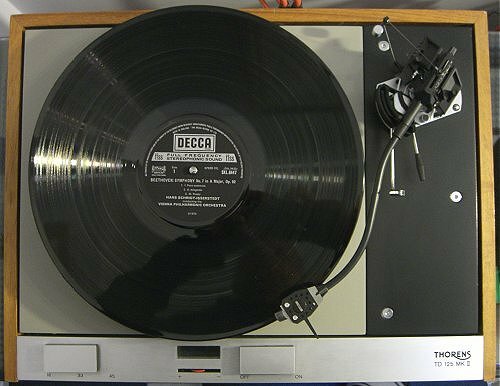 When I play it on my Thorens TD125 seen below I hear Beethoven pure and simple. It is Beethoven without the refractive prism of a celebrity interpreter, but it is most definitely not Beethoven-lite. This is red-blooded Beethoven and if you want to understand what Wagner really meant when he famously described the Seventh Symphony as 'the apotheosis of the dance' look no further than Schmidt-Isserstedt. And the sound of the Vienna orchestra captured by the Decca engineers in this 1970 recording is a pure and undigitised delight. To my ears the sum of the parts becomes even greater when they remain in the analogue domain without the parsing that is integral to digital encoding. Yes, my 1970s LP pressing suffers from the notorious Decca clicks of the time. But the breadth and width of the soundstage still put the digital equivalents to shame. Why do we accept that a Stradivarius can defy science and logic by sounding better than a 21st violin, yet still deny that a 1970 LP can sound better than the 2011 digital equivalent? Sadly Hans Schmidt-Isserstedt's recordings have not fared well in the age of the celebrity interpreter. 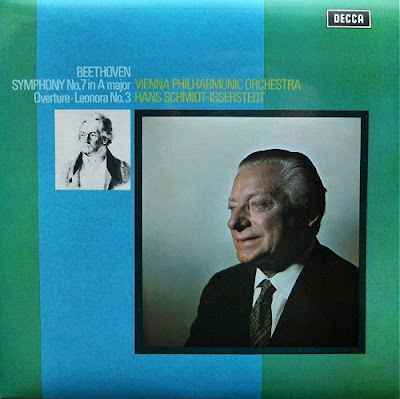 His Vienna Philharmonic Beethoven recordings did appear on Decca mid-price CDs, but they all now appear to be deleted. A slew of very fine opera archive recordings from his time in Hamburg comprise this great conductor's CD legacy. Unless you go hunting on eBay. But, happily, there is an alternative. In 1982 another great German conductor took over the orchestra that Hans Schmidt-Isserstedt created in Hamburg. The critic Wolf Eberhard von Lewinski description of Günter Wand applies equally to the founder of the NDRSO, Hans Schmidt-Isserstedt. 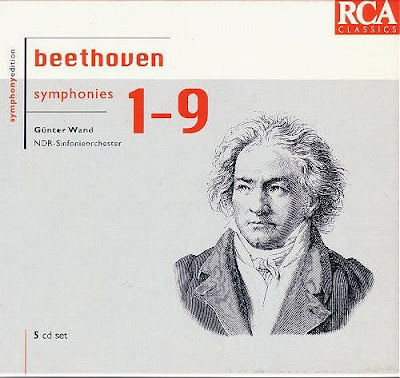 In the 1980s Günter Wand recorded a cycle of the Beethoven Symphonies with the NDRSO. They may not quite reach the same giddy heights of Schmidt-Isserstedt's Vienna cycle, but this is still Beethoven pure, simple, and unmissable; yet these recordings, which are captured in excellent sound, are virtually unknown today. I paid a bargain £30.99 for the 5 CD RCA set (seen below) in September 1995, and it is still available for around that price. Beethoven, pure and simple, has never been cheaper. * With thanks to Leo Carey who took us down this path. Leo actually asked me two years ago to write another piece about favourite record stores, and that is how this article started. But, like many paths it went of at a tangent. To keep the record (pun intended) straight, my copy of Beethoven's Seventh Symphony, was bought in 1974 from a small independent record store in Ewell, Surrey called Lesley Bond Music. It was one of those long-departed shops where teenagers listened to 45 rpm singles in listening booths lined with acoustic tiles - 1974 was the year of Abba's Waterloo but I won't go there! Having seen John Bormann's film Zardoz, which uses the Allegretto second movement during the closing scene, I was looking for an LP of Beethoven 7 and Mr Bond recommended the Schmidt-Isserstedt interpretation. At which point another path emerges, because the main music credit for Zardoz, which is available on DVD for less than a CD, went to David Munrow. I know it's not analogue, but the Schmidt-Isserstedt Vienna recordings appear to be available on Spotify. Oh lordy! That photo of the Thorens + SME arm brought back a wave of real nostalgia. If your SME has a Decca cartridge installed it was exactly my setup lo those many years ago. ACD, many thanks for that and indeed vinyl lives. But I'm afraid it is not a Decca cartridge in the SME arm. For may years it has been an Audio-Technica AT-F3 which replaced the Shure V15-3 that I originally built the Thorens/SME combo with. I'm too young (27) to have done vinyl the first time around, but I picked up a Thorens deck a few year ago for £50 largely because of the amount of repertoire and performances not available on CD and also because you can pick up LPs so cheap. Pliable, thank you so much for your kind recommendation. It’s early days yet, but I hope the blog will grow into something good!